Each piece of amber is unique with a history all its own. Over 40 million years old – and captured in this delicate necklace. The amber heart – a sign of everlasting love. The interplay of contrasts makes this filigree piece an impressive eyecatcher. The design of the curvy heart-shaped frame and snake chain is very modern. 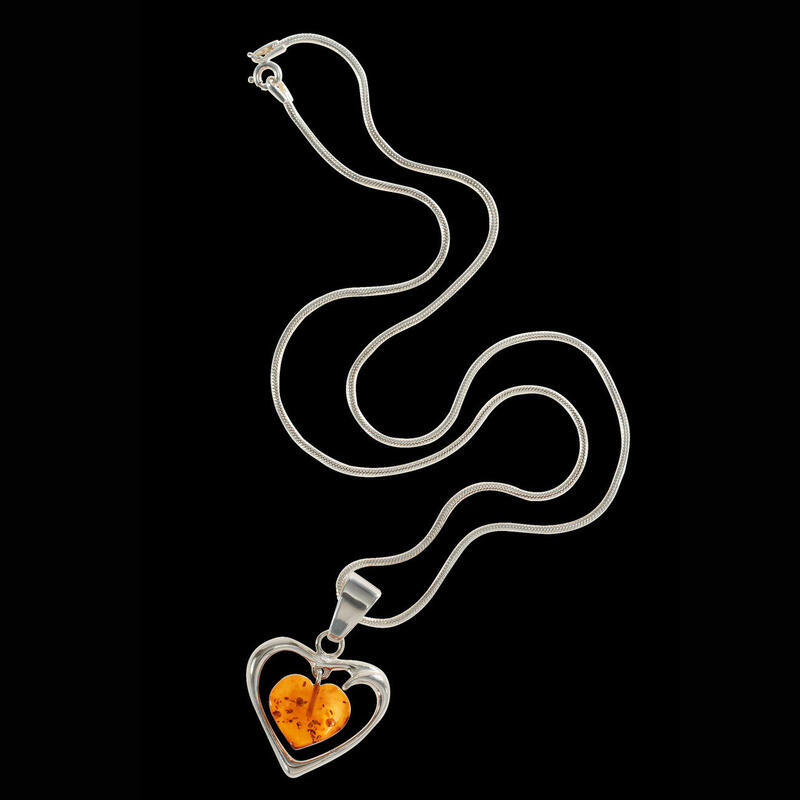 The “floating” amber heart at its centre traces its origins back more than 40 million years to the Palaeogene period. The 925 sterling silver chain and setting appear cool while the amber emits its typical warm golden glow. It’s not called the “Gold of the North” for nothing. Amber is the solidified resin of prehistoric pine trees and as such a natural work of art, unique and beyond compare. It is cut and ground in the traditional amber city of Danzig (now Gdansk, Poland). Thanks to our excellent connections to archaeological sites and the support of the Amber Museum in Bad Füssingen (Germany), we can now offer this exceptional quality amber jewellery at such an attractive price. The necklace is 1.2mm (0.04") in diameter and 47cm (18.5") long. The heart pendant is approximately 2.5 x 2.5cm (1" x 0.7"). Genuine amber and 925 sterling silver. Exclusive to ­Fashion Classics.